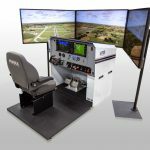 Frasca International, Inc. reports rising demand for its general aviation aircraft Flight Training Devices (FTD) and AATDs (Advanced Aviation Training Devices) from collegiate flight training schools affiliated with colleges and universities. 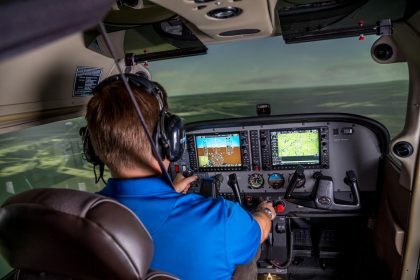 “We’re seeing strong simulator orders from collegiate flying schools as they transition to a new training aircraft model or upgrade their fleet from analogue to digital glass cockpits,” says John Frasca, President of Frasca International. Flight schools and pilots are invited to “test fly” Frasca’s latest Cessna 172 Level 5 FTD equipped with real Garmin G1000 avionics at EAA AirVenture 2017 in Oshkosh, Wisconsin (July 24-30). The FTD will be at Booth #56 in the EAA’s Aviation Gateway Park, which is a showcase for the latest and greatest in innovative aerospace science and education. 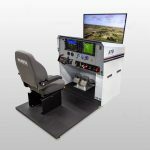 This year Frasca is once again partnered with the Alpha Eta Rho (AHP) Aviation fraternity to provide Certified Flight Instructors for free simulator flights at Oshkosh. 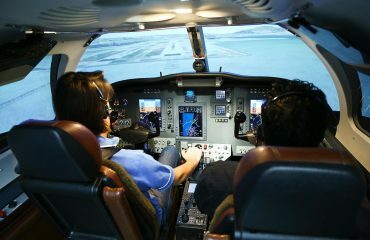 Bob Clement, Chairman of the Board of Alpha Eta Rho, added, “Alpha Eta Rho is honored to partner with Frasca International to promote aviation education, training and safety to the next generation of aspiring aviators.”Founded in 1929, AHP is the oldest professional aviation fraternity. First time pilots will be given a free logbook (sponsored by Frasca and Sporty’s Academy, Inc.) to encourage ongoing flight training. Last year, the University of North Dakota John D. Odegard School of Aerospace Sciences (UND) ordered multiple Frasca Level 5 FTDs and AATDs for the Piper Archer TX and the Piper Seminole with a G1000 NXi in conjunction with an order for 100 new Piper training aircraft. Elsewhere, Frasca FTDs can also be found at Central Texas College in Killeen, Texas (Piper Archer FTD), Western Michigan University in Battle Creek, Mich. (Cirrus SR20 FTD), Middle Georgia State University in Eastman, Ga. (Piper Archer Mentor AATD) and CAE Oxford Aviation Academy in Mesa, Arizona (Diamond DA42 FTD). 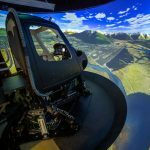 Frasca International is the oldest and largest simulator supplier to collegiate flight training schools thanks to its ongoing investments in innovative technology, high operational reliability and 60-years of dependable service and support. 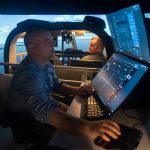 The company also has a long history of collaborating with collegiate training schools on research projects that enhance training value and increase aviation safety. “When Rudy Frasca founded our company as a grassroots aviation business, he instilled a passion for flying and developing the very best flight training simulators,” says son John Frasca. For more than 40 years, Frasca has participated in the EAA’s annual fly-in as an airshow performer, Warbird owner and corporate exhibitor.